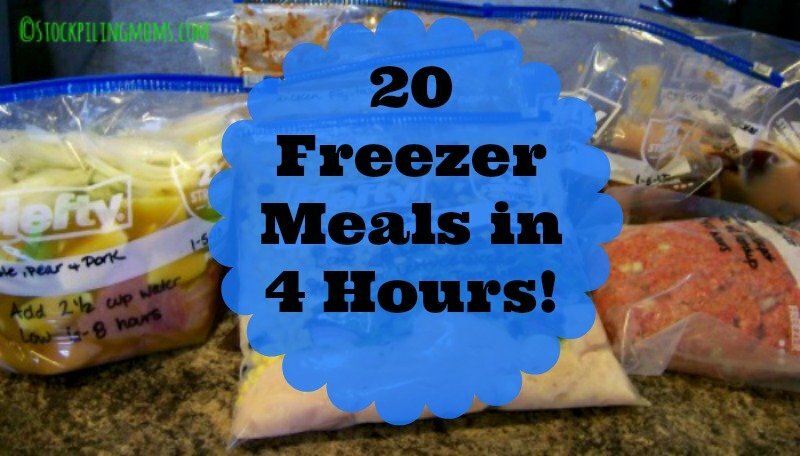 We are excited to share with you our 20 Freezer Meals in 4 Hours meal plan. 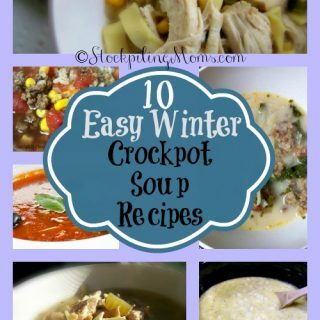 This plan will allow you to have dinner planned for almost three weeks or more depending on your family size and if they like to eat leftovers! I love to save time in the kitchen so I can enjoy more moments with my boys. I also like to be prepared and know what I am serving for dinner so I am not spending time looking around for what I am going to make. When I freezer cook I save both time and money. This was my third time prepping freezer meals for my family. I will say that the first time took a long time but I am now getting a rhythm down and get through it in no time. If you think 4 hours is a lot of time you have to consider that you are going to have 20 meals ready at the end of the 4 hour time! 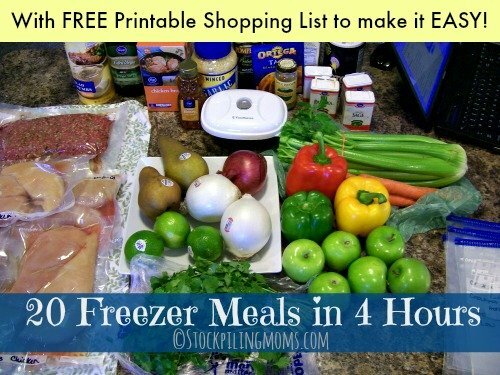 If you are new to preparing freezer meals or don’t have the 4 hours to invest you may want to start with this plan —–>How to make 8 Freezer Meals in 2 Hours. We love it too! 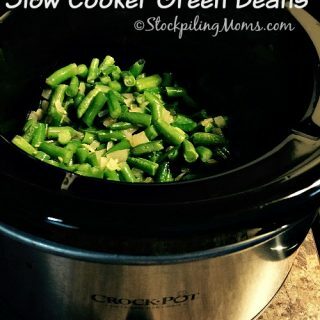 First of all invest in a good quality slow cooker. Our favorite is this programmable cook and carry 6qt oval slow cooker. 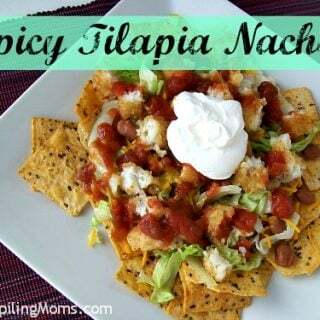 To start you will want to go through your kitchen and pantry and make a list of what ingredients you will need to get at the store and what you already have on hand. I had all of the chicken, beef and spices in my stockpile. I spent the majority of money on buying fresh produce. A great way to save money is to purchase your meat in bulk from ZayconFresh. I LOVE their chicken! When you are ready to prepare the meals you will want to set everything out on the counter that you will need. 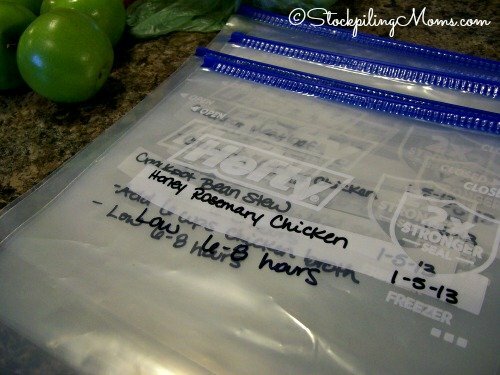 Next, you will want to label all your ziploc bags with cooking times and if you need to add anything to the recipe when you place it in or out of the slow cooker. The next step was to cook any meat that needed to be cooked for a recipe (ground beef for Crockpot Taco Soup). I did this first so that the meat could cool before putting in the bag. Next I got to chopping, slicing and dicing the veggies and fruit. I put them in bowls to keep together to make it easier when I needed to measure them out into bags. At this point I started with my meals that contained whole chicken breasts that did not need to be cubed. I filled the bags with the chicken and added ingredients. Placed the bags in the freezer and then started on my meals that needed to be in foil pans or baking dishes (Chicken Divan). 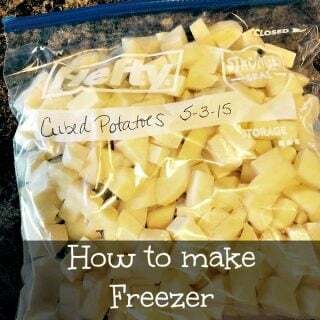 After they were completed they went in the freezer (be sure to label the foil you wrap them in). I was super excited to know that my family had meals for the next three weeks and I would not have to stress about it. One of the best parts is when I went to the store I spent less than $50 dollars on what I needed, however I did not buy any meat or poultry because it was in my stockpile. You may also want to consider investing in a food saver if you decide to freezer cook on a long term basis. It extends the life of your frozen food by up to two years according to the manufacturer. 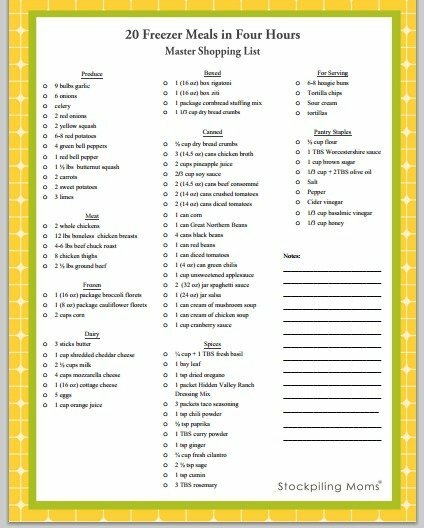 To make this process even easier for you we have a FREE Printable shopping list for you for the ENTIRE plan!!!! Just print this list and you are ready for the store! We also have an individual shopping list for each recipe in case you are interested in specific recipes without preparing the entire plan. We included a single, double, triple and x10 for each recipe. Hope you enjoy! 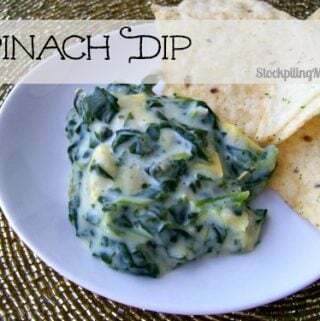 You will simply click on the recipe link below and print the recipe then you will print each shopping list or the master shopping list depending on what you prefer. 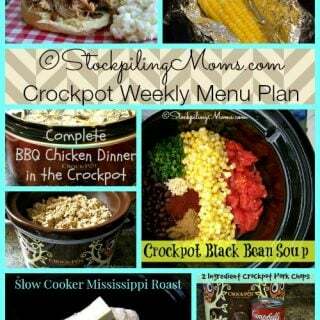 We also have 8 Crockpot Freezer Meals in 2 hours plan too! 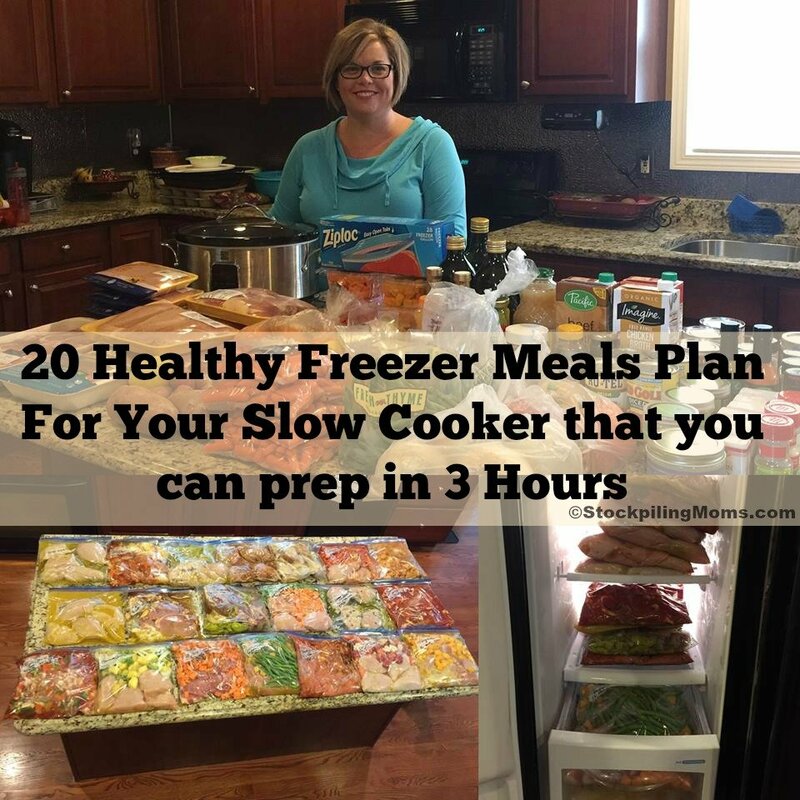 We have a 20 Healthy Freezer Meals For Your Slow Cooker in 3 Hours Plan too! 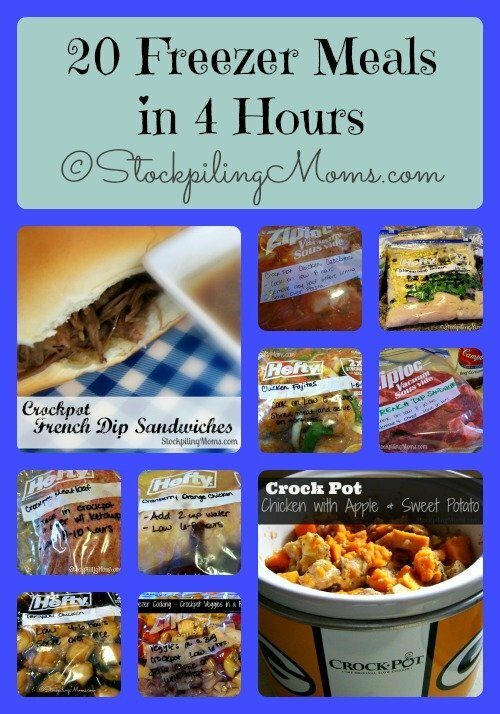 We have a 10 Crockpot Freezer Meals in 2 Hours Plan too! 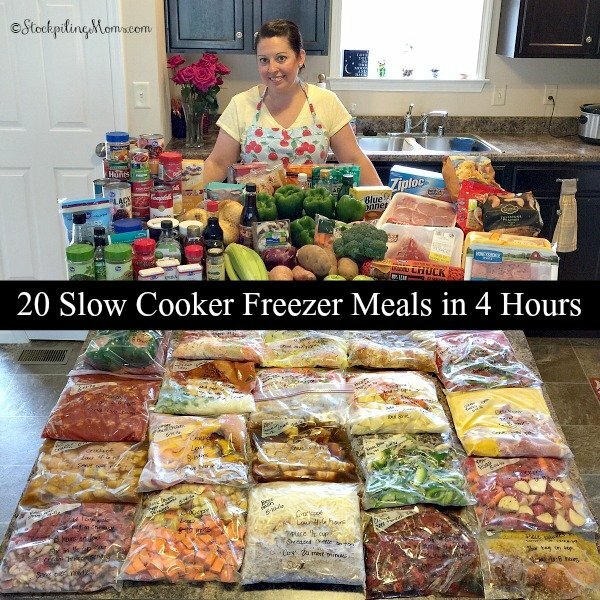 We have a 20 Slow Cooker Freezer Meals in 4 Hours Plan too! New to Freezer Cooking? 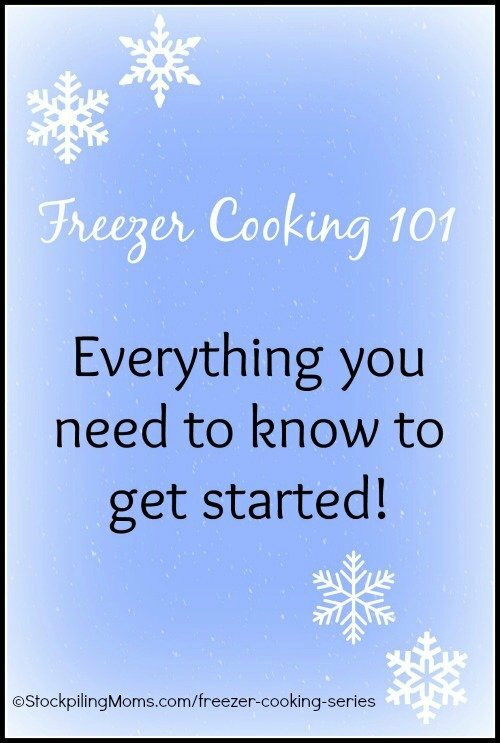 We have a Freezer Cooking 101 Series that you may enjoy! I’m sure I’m just blind, but I only counted 17meals on the list. What are the other 3? I know I roasted an extra chicken during the Divan Chucken preparation. What do you suggest we make with it? Thank you so much for this plan! This is awesome! Which three recipes are doubled? How did you have that much chicken already in your stockpile? 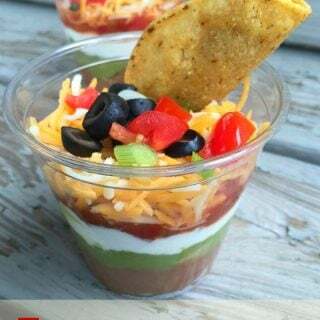 Did you have it frozen, thaw it out to make the recipes and then freeze it again? We purchase 40 lbs boxes of chicken from Zaycon – We either bulk cook the day after we pick it up or we use it frozen (do not thaw and make the recipes and re-freeze). I’ve always heard not to thaw then refreeze, but why? Also what about the chicken I buy in the store? I think it’s been previously frozen then thawed in the meat display case then I buy it, take it home, separate and freeze. I never realized it but now I’m wondering about it all. The U. S. Dept. 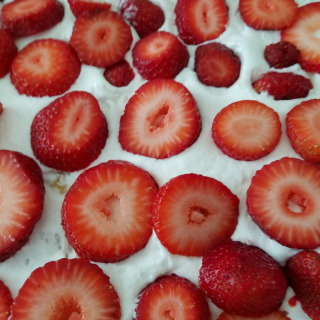 of Agriculture (USDA) advises: Once food is thawed in the refrigerator, it is safe to refreeze it without cooking, although there may be a loss of quality due to the moisture lost through thawing. After cooking raw foods which were previously frozen, it is safe to freeze the cooked foods. You don’t need to print them. We cook with our laptop or off our phones all of the time. Just pull the recipes up when you are ready to start. I see the French dip & veggies are doubled. Which is the third? I’m wondering if you have a plan stating what order you made these meals. I would love some direction! The shopping list is awesome. You can do them in whatever order that you want but we normally do all the like meats together at the same time and then move down the list. I couldn’t find it, but maybe I missed it. How many are these meals serving? They serve a family of 5 with no concern – ages 15, 11 and 5 are the kids served plus 2 adults. Hi! We also have a family of 5. But they are all adults and I also have a 1.5 year old. Will this be enough for all the adults? Thank you! This would be enough for reasonable size servings 🙂 You can always add an extra protein (chicken breast) or buy slightly larger meats. Do I cook the beef and chicken before hand or just the beef? 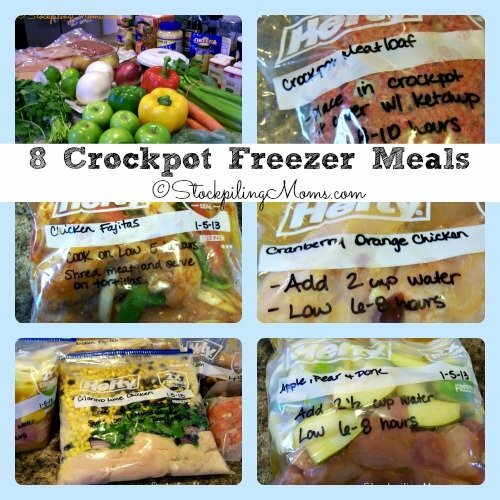 I know some crockpot recipes call for frozen chicken and take just as much time as these. You do not have to pre-cook the beef and chicken 🙂 Each recipe will give you specifics though. We are on day 5 of these meals and everything has been very satisfactory. I made all of the freezer meals exactly as instructed, and tweaked some of them before serving to adjust for our family’s taste. 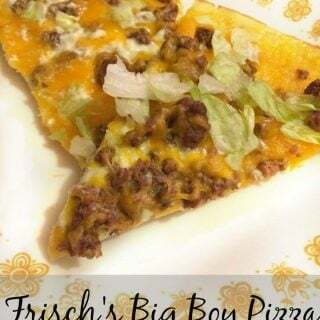 Every fourh day we have had enough that we have a leftover’s night (we are a family of 3 adults).I can’t recommend trying this out highly enough, especially for busy families, it makes life so much easier. One tip I can give is to buy two rotisserie chickens when shopping, and after you clean the meat off the chicken carcass (you can do this the day before) and make your chicken stock from the carcasses and your mirepoix. It saved me $15 on stock! 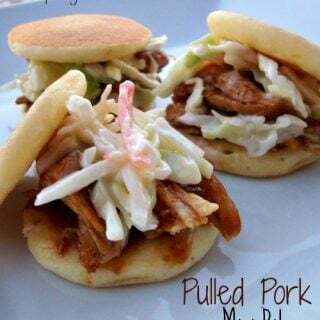 Also, if you wanted to mix the meats up with less chicken you can substitute pork or beef on a lot of these recipes. 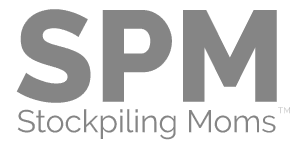 Thanks so much stock piling moms! So on the master list you said 2 whole chickens. Did you mean 2 frozen chickens cause thats what we bought yesterday and none of these recipes are listing a whole chicken. I’m really hoping I didnt waste money those..
Hi there – I’m getting ready to embark on this project during the upcoming long weekend. So excited!!! 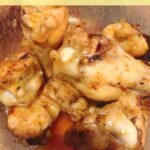 I was wondering about the whole chickens too….seems that Corckpot Cranberry Orange Chicken calls for any kind of chicken (1 lb) – is this one of the whole chickens? Not sure how much is 1 lb of meat. What is the other recipe for the other chicken? Also, what is the “3c Roast Chicken Master Mix” listed in the Chicken Divan recipe? Thank you so much! The Chicken Divan uses the Whole Chicken to make the Roast Chicken Master Mix. 3 cups cooked chicken normally equals (1) Whole Chicken. Hope that helps! That’s great, thank you. Is there something else that goes into the “Roast Chicken Master Mix”? Not sure what that is. 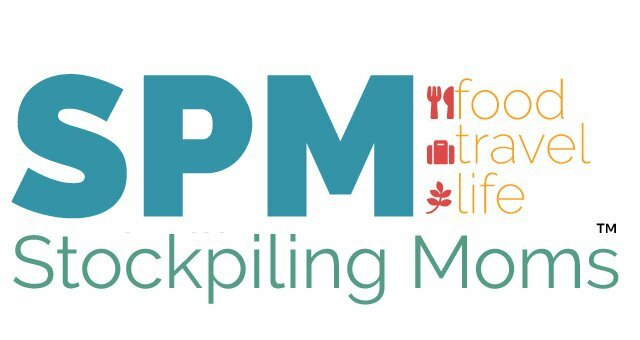 When Stephanie went to the store she spent less than $50 dollars on what she needed, however she did not buy any meat or poultry because it was in her stockpile (as stated in the blog post). I would guess $100-$125 if you are purchasing your meat. This is something I definitely need to start doing – I can definitely imagine how much easier this would make the whole 30 program if I had the week’s dinners already planned out and frozen. <3 Thank you for this! Thank you stockpiling moms. I am so excited to get started doing this for me hudbsnd and I. Wish I had tried it sooner when I still had 3 growing, hungry boys at home. I will be sharing some of the recipes with my retired parents. And I look forward to seeing and trying your ideas from Whole30. Thank you for answering so many question too! I am in desperate need of this kind of planning for my family, super grateful for your hard work and sharing! I am struggling with the format and copy pasting the list to import in Trello or simply excel. Is there a list you could send so I can shop the recipes electronically and check off my list over and over again? I am sorry we don’t have one electronically at this time. If you use a “note/list” app on your phone it will work quite nicely. Just check off what you already have at home and then as you by your ingredients. As long as you don’t “delete” checked items, your list will remain when you are finished shopping. Takes a bit to create the list initially but it is a 1 time deal. I created a separate list for each of the plans. Freezer meals are great. I’ve been doing them for my family for about a year. I’m excited to try your list. Thanks. It would be awesome if there were a document that listed the recipe/directions for each of the recipes in this series rather than having to click through each page. Or am I missing that somewhere? Sorry – you will have to click through to each recipe. Some of us do not have reliable internet. You have the technology to put together a series of Ebooks that I would be happy to pay a couple for bucks each for. The other problem with this website is the ads; they slow my pc to such an extent that I can not just open and print each recipe. This makes it a cumbersome process. you have no idea how much I do not want to come back here for this info. This info would be a big help but maybe I can find a similar ebook elsewhere. I’ll keep checking back just in case you decide to help those of us that can not depend on the grid always being available. Thank you.. .
That is a good idea. We are looking into that. YES!!! That is taking me forever & I was hopeful to have it all in one place as well. Maybe next time…. I bought everything on the shopping list and I don’t see any uses for the pork tenderloin? Or for that matter half the things on the list? Am I not seeing all of the recipes? I don’t see a pork tenderloin on the shopping list? So all the ingredients on the list totals 95? Correct. We never said these were all slow cooker meals. I’m about to start this today and am super excited! Are we able to use regular breast in place of the whole chickens for the master mix? I’m not a fan of dark meat and would prefer all white meat. I love this idea! 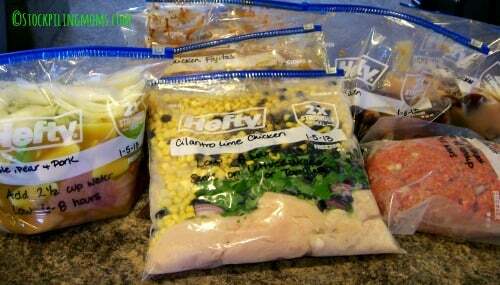 Do you add the liquids to the freezer bags or wait until cooking? Add liquids when you cook. I have printed out all of the recipes, but I am doing Weight Watchers and I know some of the recipes show the Points Plus values on them and some don’t, how would I get that information to find out how many points each meal is.Also how did you get the information for the points? hi! For the crockpot Taco Soup, is it okay that I cooked it using the raw meat, 8 hours on low, and didn’t brown it first? When u click on the recipe, it doesn’t say you need to brown it before freezing it and then thawing and cooking in crockpot, but on your main page it says to brown the beef first? Thank you! Hi!! First of all thank you!! I often meal prep, but need more. I’m starting with the 20 meals in 4 hours, I got my list supply’s and the only question is where are the recipes!? ??? Did I miss that part? Help!! I’m not seeing a link for the number of recipes mentioned, just four to five of them. Where are the links, not seeing them in this story? Thanks! They are all listed. 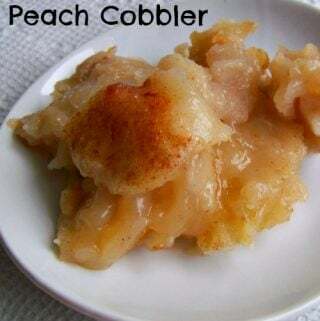 Click on each link for the recipe. We are a family of 3. 2 adults and a baby that doesn’t eat much. Would each meal be 2 days worth? If we didn’t have any ingredients on hand about how much would it take to buy everything at Aldi? I would say yes – each meal will be enough for you both plus leftovers the next night for for lunch. My guess is $200 with no ingredients on hand. This is great! A few of us are going to do it together at a church next week Is there someplace all the recipes are compiled that I am missing? You click on each recipe on the list to view and/or print. 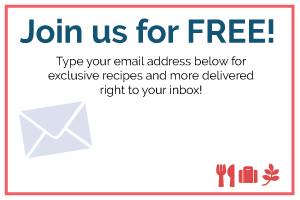 Could you email me the 20 meals and list, to many pop ups come up and I can’t get to the recipe. Please. Thank you. I’m thinking of putting these together for my family. My daughter is in college and I’d like to send her with a portion of each meal. Do you think the smaller portion would cook okay in the oven? 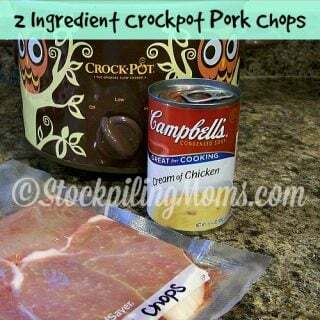 I think a smaller portion would probably not cook as well in a crock pot. What do you think? This is thorough and awesome! Can you clarify what the Roast Chicken Master Mix is in the Chicken Divan recipe is? Thanks for compiling all of this! Just found this and went to the store this morning to get all the ingredients but I cannot figure out what I use the 2 whole chickens for. There are also ingredients missing on the list like the broccoli for the chicken divine. Can’t wait to try the ones that I have completed though! These will be great to use while we are remodeling our kitchen! I figured it out! Broccoli is under frozen and I roast the chickens to use in some of the meals. 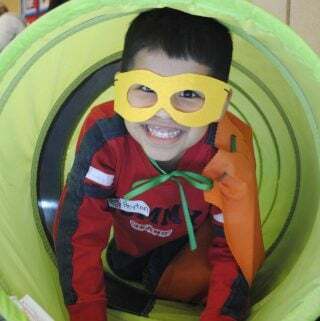 Thank you for this great resource! 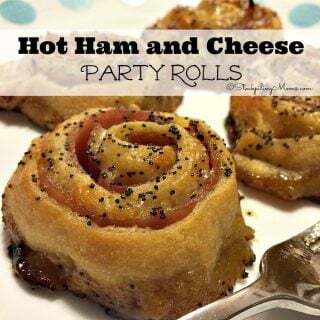 If I wanted to make some of these in an instant pot rather than a slow cooker, do you have any advice? Like which ones the instant pot may be good for, and what the conversion would be, like 8 hours on low = 20 minutes in the instant pot? 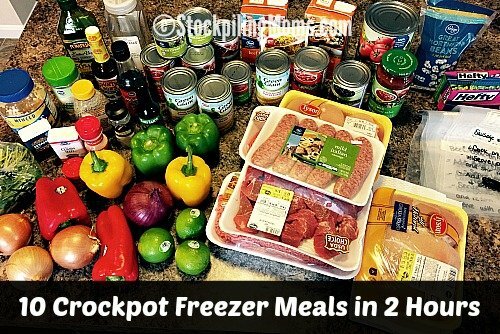 I know me, and there will be days that I wait till the last minute, so having some instant pot meals would help me.